To celebrate 75 years of State Parks, Virtual Montana is going to profile a state park each week. Here’s the first in our series: Makoshika, outside of Glendive, Montana. From the Lakota phrase (very creatively spelled) meaning ‘bad land,’ Makoshika State Park is a forbiddingly beautiful landscape of steep hills and gullies that seem to stretch on forever. As Montana’s largest state park, Makoshika covers 11,531 acres of land, which amounts to 20 percent of the state’s contiguous badlands. Around the newly remodeled visitor’s center, the Park offers interpretive displays and hosts events including Shakespeare in the Parks and Youth Programs during the summer. The pale rock that dominates much of Makoshika are the clays and shales formed from the mud that formed the sea bed when a shallow tropical inland sea covered the region. Eventually the sea receded, and a hard layer of sandstone covered the sea bed mud. Continental shift and erosion exposed the lower layer. Exposed to the harsh prairie weather, the soft clay eroded much more quickly than the sandstone, resulting in the unearthly landscape of delicate spires top by thick caprocks that characterizes the Park. Although plants can’t really grow on the clay and sandstone formations, prairie grasses, sagebrush and around 100 types of wildflowers grow thick on the flatland tops and draws. Cacti and yucca thrive in the sandy soil, and an assortment of trees—primarily Ponderosa pine and juniper, although a few other species grow along waterways—speckle the slopes. Clay pillars dwarf a hiker in this winter picture. Heavy snowfall usually closes Park roads between November and April, but the Park remains open to hikers and campers year-round. Among other activities, visitors can hunt in the fall, hike and backcoutry camp. Makoshika’s otherworldly formations create a geological textbook. When the inland sea receded, the lower layers served as the base for a sub-tropical swamp populated by Cretaceous dinosaurs, including Triceratops, Hadrosaurus, and Tyrannosaurus rex. The upper hundred feet or so of the Park comes from the Age of Mammals, and has yielded fossils of small early mammals. Makoshika is a paleontologist’s playground, and in addition to dinosaurs, digs in the Park have uncovered fossils of ancient fish, crocodiles and turtles. Stands of Rocky Mountain Juniper (Juniporus scopulorum) flourish on north-facing slopes in the draws and gullies of Makoshika. Hoofed browsers eat foliage and twigs, and birds often nest in juniper stands. However, the prize of the juniper are the bluish berries that provide sustenance for all manner of mammals and birds. 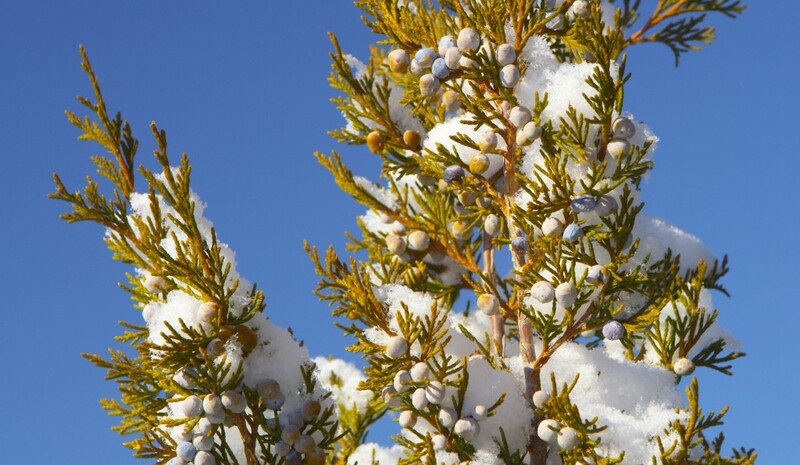 Many tribes in the Rocky Mountain west have used teas and poultices brewed from the twigs, leaves and berries of the juniper to address digestive issues and as a general pain reliever. They also used the dense wood of the juniper (sometimes called Rocky Mountain cedar) to make spears, bows and flutes. A native to Makoshika, the Sharp-tailed Grouse populate the State Park year-round. In addition to Sharp-tailed and Sage Grouse, over half of Montana’s songbird species call Makoshika home, as do Ring-necked Pheasant, Hungarian Partridge, and Turkeys. Each June, Makoshika hosts a “Buzzard Day” celebrating the spring return of the Turkey Buzzard to the Park. The carrion eaters are an essential component of the environment, and an indicator species, meaning that by monitoring Turkey Buzzards, park officials can get a very good idea of the overall health of the Park. Click here for a list of lodging near Makoshika.